stability to the knee joint. Loss or damage of the ligament can make the knee more prone to ‘giving way’. ligament must be made from elsewhere (a graft). completely numbed). You must discuss this and the risks with the anaesthetist. A tight inflatable band (tourniquet) may be wrapped around your thigh to limit the amount of bleeding. muscles or using part of the ligament that runs from the kneecap to the shin bone (patellar-tendon graft). Both involve making cuts in the skin in front of the knee. at both ends by screws, pins or slings. It is important to get the right tension on the ligament as it is fixed. The open skin is then closed with stitches or metallic clips. You will wake up in the recovery room with a bandage around the knee. You may feel sore. This is normal. However, if the pain is intolerable, it is very important you tell the nursing staff. -Some patients simply avoid activities that cause their knees to be unstable. injury. The knee may still however be prone to ‘giving way’ and instability. -Wearing of a brace can replace the ligament and for some patients this will be all that is wanted. The decision to proceed to a reconstruction should be a joint one between yourself and the surgeon. including enough to go home with. persist after the procedure. A repeat arthroscopy or other knee operation may be required. GRAFT RUPTURE: (torn graft) this may occur after further trauma. Further surgery may be necessary. 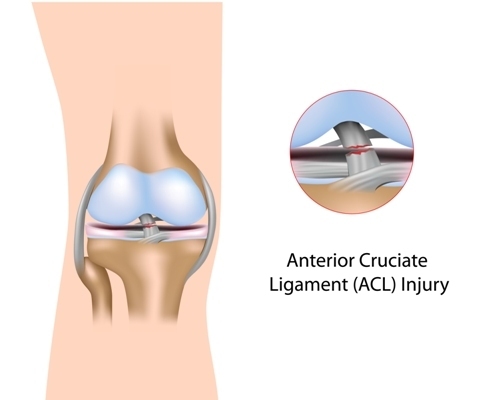 DAMAGE TO STRUCTURES WITHIN THE KNEE: this is rare, but may cause further damage and symptoms. may also be numbness of the skin under the tourniquet, this is usually temporary. common in Afro-Caribbeans. There may also be delayed wound healing for numerous reasons. to prevent death of tissue of the lower leg/ foot. OSTEOARTHRITIS: this can be more common after joint operations. thrombosis (or a suspicion that you may be at risk, please speak to your doctor).